Safariland Drug Test Identifies Krispy Kreme Donut Icing As Meth! You are here: Home / Drugs / Safariland Drug Test Identifies Krispy Kreme Donut Icing As Meth! 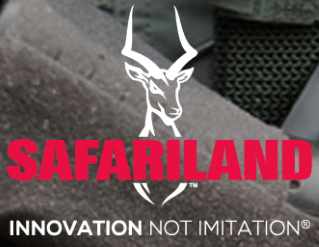 Safariland has grown into a multi-faceted firearm and safety corporation. A recent report claims a Safariland drug field test kit identified Krispy Kreme donut icing as methamphetamine. Having consumed too many Krispy Kreme donuts in my lifetime I have to admit that eating more than one Krispy Kreme donut at a time can cause the eater a serious bit of the sugar shakes. But is the Krispy Kreme donut icing meth!? At least one Safariland drug test kit says yes! This adds a whole other meaning to the image of cops and donuts. Safariland is perhaps the most prolific manufacturer of law enforcement products in the nation. This includes a range of field drug test kits developed by companies acquired by Safariland over the years as a part of their expansion into broader markets. However, after this recent report there is a serious question about the validity of at least one of their methamphetamine field test kits. Any agency or officer using the kits should be aware of this concern before continuing their use. Law enforcement agencies should evaluate how their officers are trained on using the kits to make sure proper procedures are being followed. In addition, agencies should likely have their State Crime Laboratory evaluate the kit for proper efficacy. Orlando Police are now facing a lawsuit for false arrest. 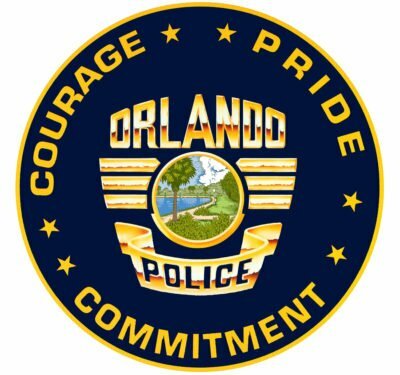 The Orlando Police Mix Up! 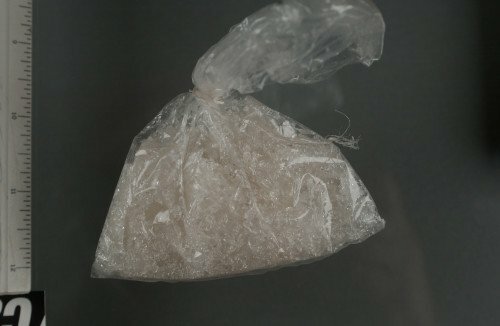 A Orlando, Florida man is suing Safariland after he was arrested for possession of methamphetamine during a car stop. According to media reports, the Orlando area citizen had just gone to Krispy Kreme doughnuts and had just finished eating a glazed donut inside of his car when he was stopped by Orlando Police. It is unclear why the Orlando Police test kit provided a false positive (photo by City of Orlando). During the stop the officer noticed a white substance on the driver’s floorboard. The officer questioned the driver about it, and he explained he had just eaten a donut. Not convinced, the officer had the driver exit the vehicle and seized a couple of white, flaky substances from the driver’s floorboard. Reportedly, a Safariland field test kit was used on the substance and tested positive for methamphetamine. The driver was arrested, transported to the police station, and was held for several hours during the investigation. FDLE is Florida’s State Investigating Agency, with full arrest powers. They also run the State’s crime lab. The Florida Department of Law Enforcement tested the icing and determined the seized items contained “no controlled substances”. The prosecutor quickly dropped the charge. The driver is now suing the Orlando Police Department and Safariland for his false arrest. The driver’s lawsuit claims the Orlando Police Department did not train the officer properly, and the Safariland test kit was defective or unreliable. As typical for ongoing legal proceedings, neither Orlando or Safariland have made a comment yet. 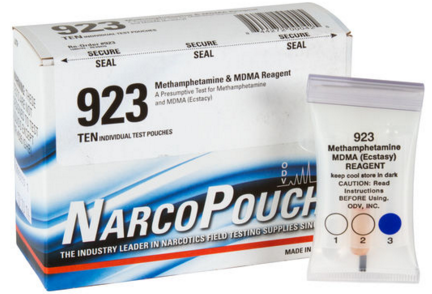 NarcoPouch is a very popular test kit brand owned by Safariland. Safariland is one of the most respected manufacturers of law enforcement, safety, and personal defense equipment and clothing in the world. Their products are used extensively in the United States and across the globe. The BlueSheepDog Crew has owned, used, or been issued a wide variety of law enforcement products or clothing from Safariland, and have found most to be excellent products. So far I have not been able to determine which Safariland brand made the false positive. During my career I have used NIK and NarcoPouchfield tests extensively. So far I have not had any problems with these test kits, and have made numerous valid arrests and cases based partly upon the results of these tests. The test kits are relatively inexpensive, and officers can be trained on their proper use and test result analysis in less than an hour. However, I have found many agencies do not perform an official training program on the drug field test kits and this could cause very destructive results. If an officer makes an arrest based on performing the test improperly it places the officer, department, and governing agency at risk of liability in a civil rights violation suit. In addition, having several false positives will begin to tarnish the officer’s and department’s credibility with the prosecuting attorney. 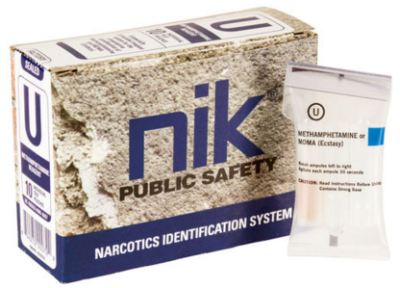 The Safariland NIK test kits are also very popular. Evaluating the color at the end of the test for a positive/negative result. We were also encouraged to read the directions from box containing multiple kits (not the ones on the test kit themselves which only explain the order to break ampoules). In all reality, following the manufacturer instructions should be more than enough to satisfy the requirements of the field test. Hazardous drug manufacturing materials are often not brought into court. Later in my career I was assigned to a HIDTA Drug Task Force. During that time I went to the Regional Crime Laboratory and received instructions from a chemist. The more detailed instruction included all that I had already learned, but also explained the chemical process the kit performs on the suspected drugs, false positives and what causes them, proper analysis, and proper disposal. (EDITOR’S NOTE: If your agency simply has you place the plastic pinch on the test kit and throw it away, you’re liable to have an exposure to acid – both contact and/or inhalation. These kits use powerful acids to break down the substance to be able to react with the intended controlled substance. After a test kit is completed and photographed, the user should add baking soda or another approved base substance to neutralize the acid. I cannot imagine a Court in this country wanting an actual test kit brought into court as evidence. They understand the dangers and do not want to be exposed themselves. Try bringing a meth lab into Court … photographs should suffice). If you ever have the opportunity to have a crime lab analyst/chemist provide you training you should do so. This adds to your professional knowledge and the weight of your testimony. Officers need to be properly trained in using forensic evidence tools. They do not have to be scientists, but they should have training on the proper use and interpretations of forensic tools used. Just like officers must be certified to use a breath alcohol testing instrument, they should have training in the proper use and interpretation of field drug test kits. At a minimum an officer should be taken through the manufacturer’s instructions from the test kit box. Officers should understand the field test kit is “presumptive” and not an absolute. However, a positive test with a field test kit is sufficient probable cause in most jurisdictions. The Orlando incident is frustrating because it could have been due to poor training, or poor interpretation of the test, or from a defective test kit. Hopefully more information will come out, though I imagine it will be quite some time due to the pending lawsuit. Until then make sure you know what you’re doing, and if in doubt wait until a proper laboratory can perform confirmation tests.